This week something very special happened to me. I made a new friend. A real, in person friend. Not one of those people who finds you on Facebook by searching “people who at some point in time lived in my city, went to my school, worked for my employer, and/or has a somewhat tenuous connection to me through a friend of a friend of a friend”. Don’t get me wrong. I have lots of those too which is fine since there’s not much maintenance and at least a couple of them probably take the time to read this blog each week. And sometimes it might even make sense to find friends that way. The other day I went searching through the computer generated list of “friend possibilities” on FB and there amongst all the people who know people I know, was someone whose only common characteristic is that we share exactly the same name. Which I guess is not such a bad thing on which to base a friendship and, I will have to admit, almost made me want to send her a “friend request”. Because I started to imagine what would happen if everyone on FB friended everyone else with the same name. In my case it would generate nine new instant friendships but for some people I would imagine it could run into the hundreds. Think about it. All the people in the world who share the same name could eventually be friends. And every once in awhile they could arrange a get together in one of their cities and it would be really easy for them to meet each other because it eliminates a multitude of problems. No more embarrassing moments trying to put a “name to a face”. 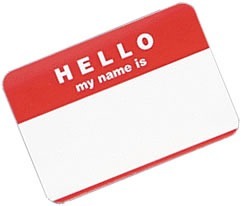 No more worries about where to place those silly “Hello, My name is…” name tags that often interfere with the presentation of your painstakingly put together ensemble. And if you have so much to drink that you can’t remember your own name, well there’s going to be someone around who can help you out. I’ll admit that checking in at the hotel could be a little problematic but you have to agree it does shine a whole new light on finding a place where “everyone knows your name”. But I digress. For many of you who know me well you are probably surprised to find out that I have a new friend since you are accustomed to hearing me say that my “friend drawer is full”. And for the most part, it is. But there are times when you just have to find a little extra space, to make room for just one more paperclip in your mountain of office supplies. And this was that time. This week I made my new friend at the mall while paying for my purchases. Somehow during the usual vacant chit chat that occurs while totals are being tallied and credit cards are being charged, the cashier and I bonded. I mean really bonded. In that very short time I learned enough about her to know we have a ton of stuff in common. She is 33 years old (ok we don’t have that in common) but she told me that she has lots of older friends so it’s ok. She has a university education and so do I. She recently moved to our city from my old stomping grounds in Ontario. She likes her new digs but she doesn’t like the cold, and I’m with her on that. She likes the same clothes that I do which kind of goes without saying since I was shopping in her store. And she loves a good sale which is how we met in the first place. This relationship moved along so quickly that before we knew it we were planning a shopping trip to Seattle which is, coincidentally where I am going this week, but since she can’t get the time off at such short notice will have to wait until next time. Now I know some of you are thinking this may not be as real a friendship as I think it is and that I might be better off focusing on connecting with the same name people. But I’m happy with the arrangement that me and my new friend have. I mean let’s face it. She’s always going to smile when she sees me coming; she’s going to do whatever she can to help me out; and no matter what I put on, I’m pretty sure she’s going to tell me that I look great. And as Ms. Warwick would say “that’s what friends are for“. But you know, now that I think about it, she doesn’t even really know my name.